Advocates of open access (OA) argue that being freely available gives OA articles a citation advantage over pay-to-access-only articles. Indeed, while results are mixed, available research does tend to support that argument. However, is this advantage enough to overcome other factors that affect individual scholars’ citation rates, such as gender, race, and academic rank? Amy Atchison has conducted research into whether Green OA can counter the gender citation advantage enjoyed by men in political science and results show that self-archiving does significantly help women. Gender bias is well-documented in higher education. This includes well-known issues like harassment of female academics, lower rates of promotion and tenure (P&T), an 18% wage gap, and a dearth of women in higher education administration. Gender bias in citation seems less well-known, but research indicates that in some disciplines women are cited at lower rates than their male colleagues. This finding indicates that men in those disciplines receive positive gender citation effects (GCEs). In my discipline, political science, the available evidence indicates there is a positive GCE that accrues to male political scientists. This may be related to academic networks – we cite who we know and, although they make up less than 30% of all political science faculty, women tend to be concentrated at lower ranks and in less prestigious institutions. The issue of GCEs is important since citation counts are a major consideration in many institutions’ P&T decisions. If women are cited at lower rates despite the high quality of their research, then they are disadvantaged from the outset in the P&T process. 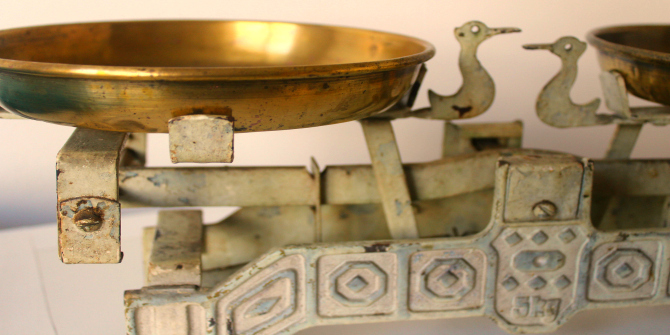 Image credit: Two-pan balance weight by Da Sal. This work is licensed under a CC BY 2.0 license. One way of increasing citations is to make one’s research freely available using the “Green” OA method (the argument for Green OA in the social sciences can be read here). This simply means that after the work is published in the journal of the author’s choosing, the author self-archives her work in an institutional repository, on a personal website, or on an academic networking site (e.g. Academia.edu). Recent research indicates that in the top 20 political science journals, Green OA articles have significantly higher mean citation rates than articles only available pay-to-access. Thus, self-archiving results in a clear and significant citation advantage in political science. Given the gender bias in political science, the importance of citation rates to P&T, and the known OA citation advantage in the discipline, I question whether Green OA offers a gender-egalitarian publishing model. In other words, can the citation advantage provided by self-archiving overcome the citation advantage enjoyed by male political scientists? To my knowledge, no one has asked or answered this question in any discipline, and yet it is an important question. Does Green OA affect gendered citation effects? The answer to this question is dependent on a number of factors: (1) whether or not the data shows a positive GCE accruing to men; (2) authors self-archiving their work; and (3) whether or not the data shows a positive OA citation effect accruing to those self-archived articles. Only after addressing these contingencies can we establish (4) whether or not the OA citation effect overcomes the gender citation effect. Taking these in order: first, there is a significant and positive GCE accruing to the male-authored articles in this dataset (regardless of OA status). Second, in my dataset more than 56% of the observations have been self-archived in some format. The gender breakdown indicates that 32% of the solo-female authored papers in the dataset are self-archived versus 49% of solo-male authored papers. Thirdly, looking at the data as a whole there are significant OA citation advantages present. Importantly, these OA citation advantages hold across gender. Given the evidence that women are at a disadvantage at all levels of the academy, I did not expect a positive answer to question four: does Green OA affect the gender citation effect enjoyed by men? However, the lack of statistical significance in all categories (as indicated by the lack of asterisks in Table 1) suggests that, in fact, Green OA significantly helps women. The Z-score indicates the certainty that the result is more (or less) than the mean; what the lack of asterisks means is that the result is not different at a statistically significant level. What Table 1 tells us is that Green OA not only provides a citation advantage to all political scientists regardless of gender, it also negates the positive GCE that typically accrues to male researchers. Thanks to the SPARC addendum, you can view the full results of the published paper here. A final caveat is necessary. These results should be interpreted with caution. First, the finding that OA can help to negate the gender citation advantage is surprising in light of previous research on gendered citation effects. This must be investigated further to determine whether it is an artefact of the data, whether the pattern holds when other data are used, and whether the pattern holds once self-archiving becomes more commonplace in political science. Second, as with any single-discipline study, the results may lack generalisability. There is considerable evidence that GCE varies by discipline, so it will be important to explore the GCE-OA interaction both within and across disciplines. This blog post is based on the author’s article, “Negating the Gender Citation Advantage in Political Science”, published in PS: Political Science & Politics (DOI: 10.1017/S1049096517000014). Amy Atchison is associate professor of political science and international relations at Valparaiso University. Her work has appeared in PS: Political Science and Politics, Politics & Gender, the Journal of Women, Politics, & Policy, the Journal of Political Science Education, and Poverty & Public Policy. Her ORCID iD is 0000-0001-7740-786X.